In the warmest category of PolarMAX's lineup the men's Comp 4 Tech Fleece Zip Top is built as your full motion base layer for aerobic exercise in extremely cold temperatures and is an essential for active athletes. 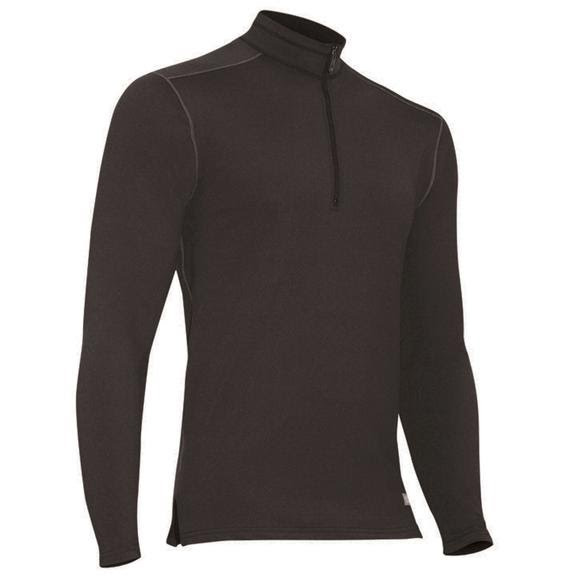 In the warmest category of PolarMAX &apos;s lineup the men&apos;s Comp 4 Tech Fleece Zip Top is built as your full motion base layer for aerobic exercise in extremely cold temperatures and is an essential for active athletes. Polarmax&apos;s Acclimate with a touch of Spandex added for a comfortable, efficient fit and a full range of motion. Acclimate fabric is exclusively featured in all PolarMAX fabrics. Acclimate rapidly pulls or &apos;wicks&apos; moisture away from the skin to the fabric&apos;s outer surface for quick evaporation, which means you stay drier, warmer and more comfortable. This type of stitching creates a seam that lies flat within the garment rather than hanging from it, eliminating discomfort associated with bulky seams. Scent Prevent is a proprietary anti-microbial fabric treatment for odor prevention that allows you to wear our base layers for extended periods of time without offensive odor. Polarmax Scent Prevent anti-microbial treatment does not wash out and lasts for the life of the garment.